The new year sees changes to both ends of the Ford range, with a transformed small car offering, lower CO2 emissions, and improved economy on larger diesel models. 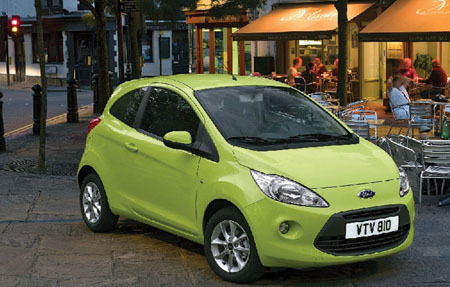 The new Ka Style is available with a price tag of €11,535, a saving of €800 on the outgoing entry level model. Despite the price, the Style lives up to its name with sassy alloy wheels, fog lights, and MP3 connectivity as standard. Both the new Ka and Fiesta enjoy CO2 emission levels of below 120g/km, putting them in VRT band A, meaning road tax of €104 per year (except Fiesta 1.6 petrol ). Another Ford small car, the Fusion MAV, offers a host of desirable extras at no cost in 2009, including BlueTooth™, voice control, and parking distance sensors. As Ireland gears up to host the 2009 World Rally Championship at the end of January, the best-selling Ford Focus is available as a special WRC limited edition from €23,895, featuring sports suspension, 17-inch alloys, full body kit, and TicToc red trim and aluminium pedals and handbrake. Meanwhile the large family buyer can look forward to uncompromised performance with a lower impact on the environment. The 2.0 TDCi Duratorq diesel engine on the Ford S-MAX and Galaxy now delivers average CO2 emissions of 159g. Fuel economy has been improved to 6.1 l/100km or 46.2mpg (European combined ). These are best-in-class figures. The same powertrain also brings CO2 emissions on the front wheel drive version of the new Ford Kuga crossover down to 159g. Engineers have introduced improvements such as a ‘sleep’ mode for the hydraulic steering to achieve this reduction.